Tastefully decorated and updated two bedroom unit in College Court boasts spacious layout with updated floor coverings including extensive use of tile in foyer, hall and dining room, attractive mouldings and attractive decorated in decorator colours. Attractive and efficient kitchen with tile floors, white raised panel cabinets. Built-in dishwasher and eating bar. spacious dining room with tile floor and ceiling fan. Living room with new carpet and cozy gas fireplace will facilitate your entertaining and family fellowship. Two spacious bedrooms including huge master with walk-in closet and four piece ensuite. Second bedroom with attractive decorating. Four piece main bath. Insuite laundry and storage. Imagine the carefree lifestyle you will enjoy here with your weekends and evenings, free from yard work, to spend doing the things you enjoy. Secure underground parking, bike room and an elevator are just a few of the amenities that make living in College Court a treat to enjoy. 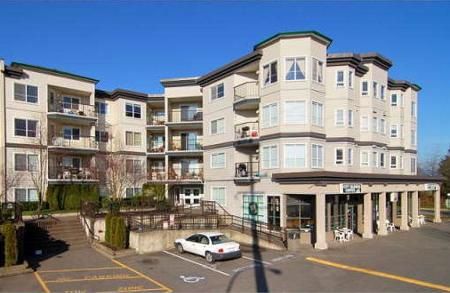 Live the good life in style in this attractively decorated suite centrally located just minutes to Kwantlen College and Langley City.